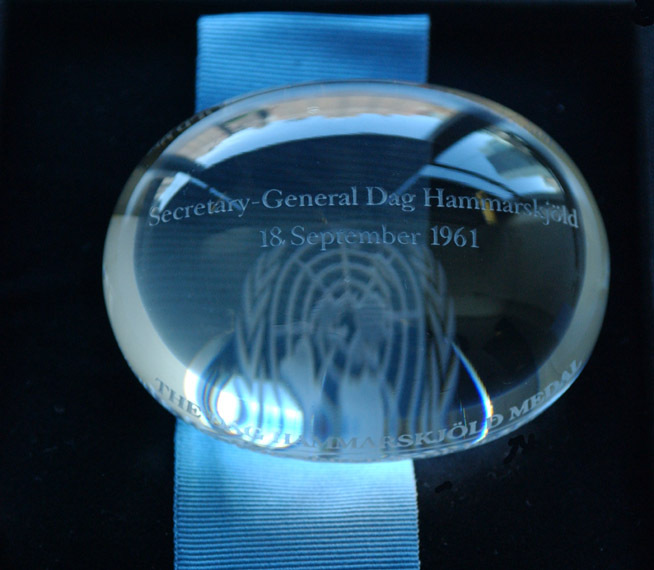 The Secretary-General established the Dag Hammarskjöld medal in December 2000 as a posthumous award to members of peacekeeping operations who lost their lives during service with a peacekeeping operation under the operational control and authority of the United Nations. Each year on Peacekeeper's Day, this medal is awarded to any Member State who has lost one or more military or police peacekeepers at a ceremony at UN HQ. The Under-Secretary-General for Field Support also accepts a medal on behalf of deceased civilian staff each year. More information is available on the Secretary-General's bulletin (ST/SGB/2000/15). The UN medal was established by the Secretary-General in 1966 for award, subject to the Regulations for the United Nations Medal (ST/SGB/119/Rev.1), to military personnel and civilian police who are or have been in the service of the United Nations. The Secretary-General has also defined the specifications of the medal and the ribbon on which it is suspended. 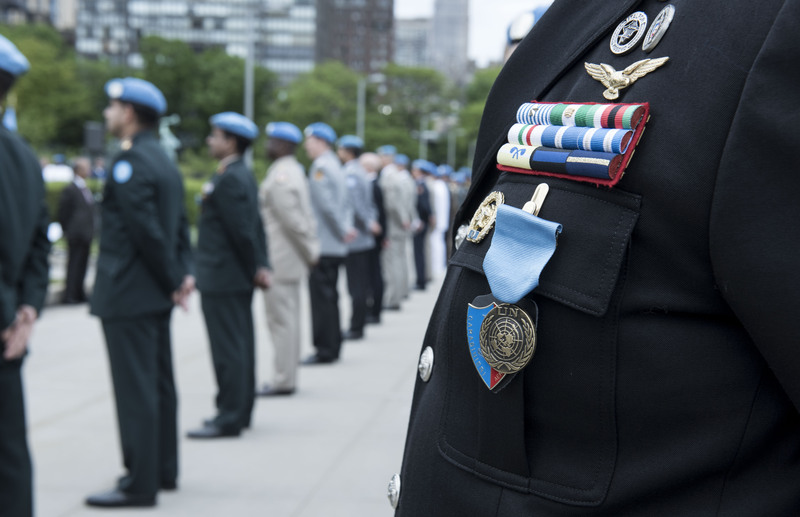 Below we provide a general description of the UN peacekeeping medals and accompanying ribbons. Where applicable, and available, an outline of the significance of the colours used for a particular ribbon is provided, an indication of the qualifying time necessary for each and a listing of the countries who provided troops, observers or police. Medal: In common usage, this term is used to indicate both the bronze medallion and the ribbon from which it is suspended. Commonly, the name of a specific mission will be prefixed, hence, the "UNDOF Medal" etc. In correct usage, this term refers to the medallion only. Ribbon: Length of material woven into a narrow band, of specific colour(s) from which is suspended a bronze medallion only. Standard: Indicates the current bronze medallion issued with a specific ribbon, indicating service with a particular peacekeeping mission. Korea: A bronze medallion bearing on the obverse the representation of the UN symbol in bas-relief and, on the reverse, the wording "FOR SERVICE IN THE DEFENCE OF THE PRINCIPLES OF THE CHARTER OF THE UNITED NATIONS", also in bas-relief. The medallion is attached to the ribbon by means of a bar which bears the name "KOREA" in bas-relief. The wording shown may be in English, French, Spanish, Danish, Greek, Italian, Dutch, Swedish, Sanskrit or Turkish. UNEF: A bronze medallion bearing on the obverse the representation of the UN symbol surmounted by the letters "UNEF", both in bas-relief and, on the reverse, the words "IN THE SERVICE OF PEACE" in bas-relief. Standard: A bronze medallion bearing on the obverse the representation of the UN symbol surmounted by the letters "UN" both in bas-relief and, on the reverse, the words "IN THE SERVICE OF PEACE" in bas-relief. This standard medallion is used for all missions except the two mentioned above. All medals listed below are considered peacekeeping medals. Please note that this record is not yet complete as we work on including images and descriptions of additional medals instituted for other peacekeeping operations, past and present.